In the course of our lifetimes, it is very likely that we will all suffer at least one eye infection. For some of us, it may be much more frequent than that – contact lens wearers and people with impaired immune systems can develop eye infections on a regular basis. Typically, there are three main causes of infection – bacteria, fungus and viruses. Read on to discover the various types of eye infections, and the steps you can take to treat them. Often associated with children, conjunctivitis also affects millions of adults around the world. It is the most common eye infection, mainly because it can be extremely contagious. Epidemic Keratoconjunctivitis – This is a form of conjunctivitis that is caused by a virus, and as a result it can spread rapidly, especially in school or work environments. Being in contact with other people, or touching objects they have touched can easily transmit the virus. 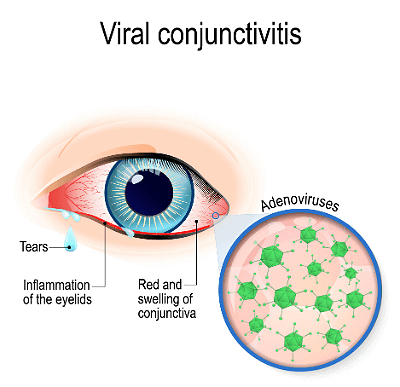 Both forms of conjunctivitis lead to the same symptoms – pink eyes, itching and discharge from the eyes. Vision may also be affected due to the inflammation and increased fluid. Treatment with lubricant eye drops helps to wash away any discharge and keep eyesight as clear as possible. One of the less serious infections is an eye stye. Although they are a nuisance, and can be very irritating, they tend to clear up within a few days. If the stye persists longer than this, book an appointment for an eye examination, where antibiotic drops may be prescribed. Styes are caused by skin bacteria entering an eyelid hair follicle, which over time turns into an infection. This results in a lump on the eyelid which can be painful and cause the eye to water. In order to try and encourage the stye to disappear, it is important to practice good hygiene. Be sure to wash your hands before and after you touch your eyes. An infection that typically presents itself as crusting along the eyelid, blepharitis is a noncontagious condition that can be caused by both bacteria and allergens. 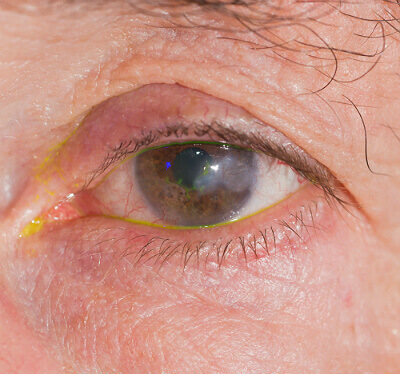 Oil glands in the eyelid become blocked which leads to redness, swelling, and the crusted appearance. Unlike most other eye infections, blepharitis is often a chronic condition that causes inflammation on a periodic basis. Indeed, if it is left untreated over the long-term, scarring of the eyelid may occur. Although it is difficult to permanently eradicate blepharitis, daily washing of the eyelids should keep it under control and minimises any inflammation and discomfort. Keratitis is an inflammatory condition that affects the cornea, and usually develops because of bacteria, fungus, or the herpes virus. It is one of the more serious infections, reducing vision and even causing blindness in some untreated cases. Living in a warm climate and wearing contact lenses are two risk factors for acquiring keratitis, as they both encourage bacteria and fungus to accumulate. Slow-growing fungal keratitis can sometimes cause an ulcer on the cornea – a painful sore that interrupts vision. A build-up of bacteria and fungus might happen due to a lack of contact lens maintenance. This can be avoided by cleaning your contact lenses and the contact lens case on a daily basis. If you suspect your lenses might be causing infections, throw away the current lenses and the case. Want to Stop Wearing Contact Lenses? If you would like to ditch your contact lenses and glasses then why not call AVC TODAY on 0800 652 4878 and request your free vision correction information pack or book your consultation to find out how we can help you.